There's nothing that makes this machine particularly special. It's just another example of an old computer with some decent performance. I guarantee it runs better with Leopard (10.5.8) than a similar era PC machine would with Vista. For the most part, I just leave it running SETI@Home and how it does there tells me it's comparable to a P3. As is listed, I've got the "Gigabit Ethernet" edition G4 tower. Specifically, the Dual 450 Mhz variety. Currently it's got a 40 GB drive and 768 MB of RAM. I'm not sure if the HD is original or not, but I know the RAM's been upgraded. It's PC100/133. There's also an ATI Rage 128 Pro. As I mentioned before, the system's currently running Leopard. It came to me with Jaguar (10.2), but it was a bit dated for my tastes. I ran it through a Panther (10.3.9) and Tiger (10.4.11) before working out how to install Leopard. Specifically, it has minimum system requirements of 867 Mhz and 512 MB RAM. The memory wasn't a problem, but CPU speed was. Researching to get it installed, there are a few ways around this. The "easiest" is to run a small patch app that uses an Open Firmware trick to temporarily make it look like the CPU is faster than it really is. This did not work for me. Aparently, this method is supposed to be manually implementable by going into the Open Firmware prompt on boot. This also didn't work. Fortunately, there's also another way to do it. It's also rather complex. It invovles editing the Leopard installer to change the check it does for minimum CPU speed. There are directions. I however modified the routine slightly, as I don't like burning disks. I don't remember exactly what I did, but I believe I used the Disk Utility to write a copy of the Leopard DVD to a spare 40 GB disk I had lying aroud. This let me create a bootable install drive that had the modifications for CPU speed. Actually using the system isn't so bad. Because it's PowerPC there's some stuff like flash that won't work, but it's not that bad at all. The biggest issue I have is that Leopard makes use of a lot of OpenGL to speed up Finder. With the low-end graphics that it's got it's not the slickest (icons don't bounce in the dock, they stutter) but it works perfectly well for what I do with it. Which is use it as a temporary desktop when my desktop goes to all hell. (And I don't feel like using my laptop. The graphics can be upgraded, either by getting a PC card and reflashing it or by buying an actually Mac graphics card. Those are expensive though. All was going well until I had to move it off the shelf it was on. The shelf in question was about to collapse under the wait, after a long drawn out failure. I relocated it to a position on the floor I hadn't thought of originally, and pressed the power button. At which point it wouldn't turn on. After dissasembly I determined that the PSU had gone, and that it wasn't going to boot up. So I dissasembled it and put it by the radiator. 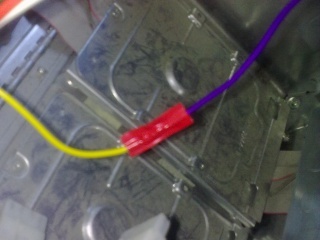 OutOfSpec.COM - Cut the red wire or the green one?! I went to a local computer fair and got a cheap ATX PSU. However, imagine my surprise when it started up again! I couldn't quite beleve it was dead so I had tried it again and it worked. I went away for a holiday, came back, it wouldn't turn on again. It turned on again. I went away for holiday again. It was dead for real. Unfortunately, at this point I had lent the spare PSU to a friend. I haven't had that PSU back yet, so I was out a replacement until just recently. So finally at long last my G4 is working again. I found that the pinout diagrams from outofspec.com were by far the most useful when it came to actually doing the work. It was mostly a simple matter of matching up the wires by voltage, with a few splices and a few wires capped off. There were however two issues. The first is the +28V rail. As I'm not using an ADC monitor, that wasn't so important. 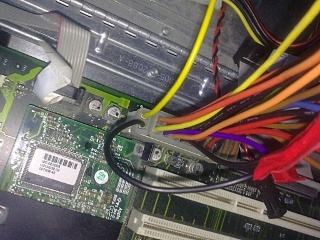 The second issue is that the connector on the motherboard of the Mac has two extra pins, for 22 pins total instead of the standard 20. 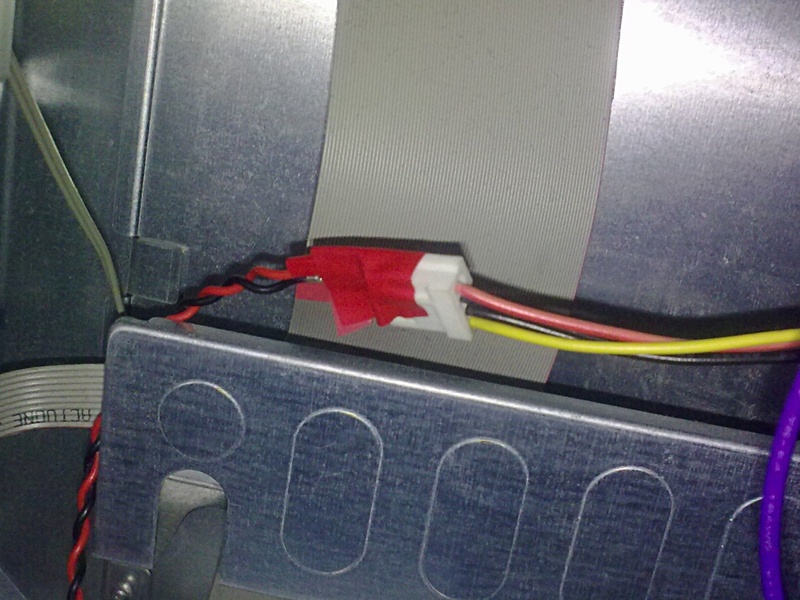 Not so much of an issue was the special power header on the PSU for the case/CPU fan. 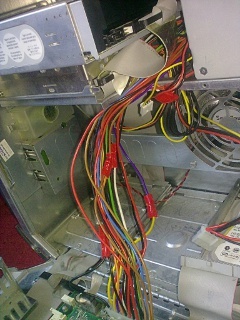 Regarding the 22 pin connector, I did not want to chop up the original PSU and have to resolder 22 wires without screwing it all up. I also did not have the bits to make a connector of some sort. I did however, have my friend's (yes the one who borrowed the PSU) old, broken PSU. After a bit of testing I managed to confirm it was well a truly dead. (The circuit breaker convinved me.) I then chopped off it's 4 pin ATX connector, and then chopped it in half to give me the two extra pins I needed. As a word of note, if anyone else does this I hope they can chop better than myself, it takes some jamming to get it in. © Guru3 - Last modified May 08 2010 09:04:41 PDT.